Stretch marks make a person self-conscious and uncomfortable with its appearance. Pregnancy is the main reason for stretch marks but sudden weight loss, rapid growth, heredity factors, physical changes and stress can also contribute. When the skin’s layer gets stretched the collagen binding it weakens. Thus damage is caused due to skin cell production which results in stretch marks appearance. Though there are many methods to treat stretch marks, home remedies are counted as much safer and effective. They may take a long time to completely remove the stretch marks, yet home remedies can their appearance and makes less noticeable. 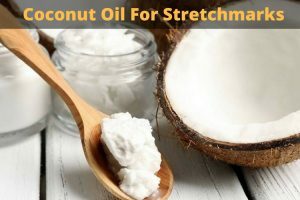 In this article, we will learn about coconut oil for stretch marks. The monosaturated fats in coconut oil make the cell walls stronger, eliminating stretch marks. The coconut oil prevents skin from sagging and delays wrinkles. Coconut oil’s antioxidant properties fight free radicals. It also soothes skin irritations caused during pregnancy. It moisturizes and nourishes the skin. Vitamin E present in it heals the scars. Vitamin K and iron encourage new cell production and remove the damaged cells, erasing signs of stretch marks. During pregnancy, if you massage coconut oil 2 or 3 times daily during the pregnancy, once the baby is born you will have less or no stretch marks. But if it is too late, here are few methods you can try. Massage few drops or a scoop of coconut oil on stretch marks. Leave it on until the skin absorbs it completely. Mix few drops each of coconut oil and olive oil. Gently massage the mixture on stretch marks. Leave it on until the skin absorbs the oils completely. For extra benefits, add vitamin E oil and contents of vitamin A capsules. Mix equal amounts of coconut oil, cocoa butter and shea butter. Melt the mixture using double boiler or microwave. Finally, now add few drops of vitamin E oil. Scoop out a little and massage in on stretch marks or belly during pregnancy. Leave it on till the skin absorbs the oils completely. Repeat the application 2 times daily. Mix equal amounts of coconut oil and castor oil. Let it rest till the oils are absorbed by the skin. Alternatively, prepare fresh mixture of coconut oil and coffee grounds. Scrub the mixture immediately for few minutes and rinse off. Mix 2 tablespoons coconut oil and 1 teaspoon turmeric powder. Apply the mixture on stretch marks. After 15 minutes, rinse off with water. For extra benefits, add 1 teaspoon lemon juice. Mix 1/2 cup coconut oil, 1 cup each of sugar and salt. Massage the mixture for 5 minutes and leave it on for 10 minutes. Store remaining mixture in refrigerator for future use. Mix 1 tablespoon of coconut oil with few drops of camphor oil. Apply the mixture on the stretch marks. Extract gel from an aloe vera leaf. Add aloe vera gel, 20 drops of coconut oil, 10 drops each of carrot seed oil, almond oil, grape seed oil, egg oil and buckthorn oil. Blend all the ingredients well and pour in an air tight container. Refrigerate the mixture or leave it in a dry place. Scoop out a little and apply it on stretch marks. Mix 30ml of evening primrose oil and 50g of coconut oil. Using a double boiler, melt the oils over low heat. While stirring constantly, sprinkle water over the mix. When a fluffy texture is formed, remove the flame. Add 2ml lemon oil and 3ml lavender oil. Whip constantly for few minutes and store the mixture in air tight container. Scoop out a little and massage it gently on stretch marks. Blend fractioned coconut oil, frankincense oil and lavender oil. Massage the mixture on stretch marks. Leave it on to let the skin absorb the oils. Avoid coconut oil if you are allergic to it. Always use virgin and cold compressed coconut oil. Perform a patch test before continuing regular treatments. Don’t scratch the stretch marks. Drink plenty of water to get hydrated this helps to retain the moisture in the skin. Exercise regularly to retain the skin elasticity during pregnancy. Include vitamin A, C and E foods in your daily diet. Vitamins help in repairing the damaged skin. Avoid applying coconut oil if you have cuts, wounds or blisters. Application of coconut oil during pregnancy helps to prevent stretch marks appearance. Take Omega-3 supplements which helps to maintain the health of skin membrane. Be patient and try the remedies regularly without fail. If you have any doubts or suggestions regarding this article, then write to us in the comments section below. Is it prosesed or unprosesed coconut oil? You have to use unprocessed, cold compress organic coconut oil. What if 5yrs of having stretchmark, is it still effective? How months will i see the improvement on it? How long would it take to see some changes?